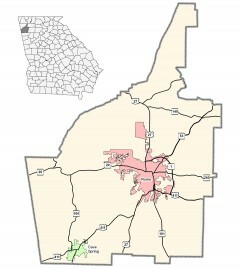 Floyd County was formed from part of Cherokee County in 1832. Georgia’s 82nd county was named for General John Floyd, a South Carolina Indian fighter and U.S. Congressman. Rome, the county seat, was established in 1834. Floyd County has two historic courthouses, both listed on the National Register of Historic Places. Other places of historic note are Rome’s City Clock, built in 1872; Myrtle Hill Cemetery, listed on the National Register of Historic Places and resting place of Ellen Axson Wilson, wife of President Woodrow Wilson; and the Capitoline Wolf. The original county seat was designated as Livingston in 1833, the county seat was moved to Rome in 1834.